Boy, put biology, geology, and chemistry together, and you get biogeochemical! When you talk about the “circle of life,” the circle to which you are referring is a biogeochemical cycle. The plants and animals that live and then die are the bio part; the earth that they decompose into comprises the geo part; and the process by which organic matter returns to the chemical elements in the earth is explained by the chemical part. There are four biogeochemical cycles, and each of them returns to the earth important elements that are required in living organisms. Plants absorb water from soil, and animals drink water or eat animals, which are made mostly of water. When plants go through the process of transpiration (that’s when water evaporates from a leaf and more water is pulled up from the roots of the plant and out through the cells on the surface of the leaf), they give off water. When animals create perspiration, they release water, which is evaporated into the atmosphere. Water also is released from plants and animals as they decompose. Decomposing tissue becomes dehydrated, which is what causes the dried-out tissues to break down and fall off into the soil. As water evaporates into the air, wind moves air over bodies of water, and precipitation (rain, snow, sleet, hail) releases water into larger bodies of water such as lakes, rivers, oceans, and even glaciers. Water from precipitation and decomposing tissue also gets into groundwater, which ultimately supplies larger bodies of water. Plants take in carbon dioxide for photosynthesis. Animals consume plants or other animals, and all living things contain carbon. Carbon is what makes organic molecules organic (living). Carbon is necessary for the creation of molecules such as carbohydrates, proteins, and fats. Plants release carbon dioxide when they decompose. Animals release carbon dioxide when they decompose or respire. (Animals take in oxygen and release carbon dioxide when they breathe.) Carbon dioxide also is released when organic matter such as wood, leaves, coal, or oil are burned. The carbon dioxide returns to the atmosphere, where it can be taken in by more plants that are then consumed by animals. Decomposing animals and plants leach carbon into the ground, forming fossil fuels such as coal or oil. Peat also forms from the decomposition of organic matter. Some carbon is stored in the form of cellulose in the wood of trees and bushes. ATP, that ubiquitous energy molecule created by every living thing, needs phosphorus. You can tell that by its name; triphosphate indicates that it contains three molecules of phosphate, which requires phosphorus. DNA and RNA, the genetic molecules present in every living thing, have phosphate bonds holding them together, so they require phosphorus, too, as does bone tissue. Plants absorb inorganic phosphate from the soil. When animals consume plants or other animals, they acquire the phosphorus that was present in their meal. Phosphorus is excreted through the waste products created by animals, and it is released by decomposing plants and animals. When phosphorus gets returned to the soil, it can be absorbed again by plants, or it becomes part of the sediment layers that eventually form rocks. As rocks erode by the action of water, phosphorus is returned to water and soil. Because amino acids build proteins, nitrogen is pretty important. Nitrogen also is present in the nucleic acids DNA and RNA. Life could not go on without nitrogen. The nitrogen cycle (Figure 1) is the most complex biogeochemical cycle because nitrogen can exist in several different forms. Nitrogen fixation, nitrification, denitrification, and ammonification are all parts of the nitrogen cycle. 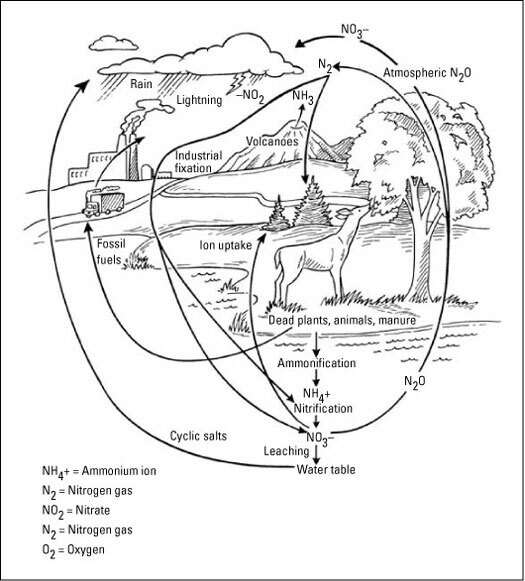 Figure 1: The nitrogen cycle. Nitrogen fixation: In the soil, as well as in the root nodules of certain plants, nitrogen is “fixed” by bacteria, lightning, and ultraviolet radiation. The “fixing of nitrogen” does not mean nitrogen was broken; a better term might be “fixated,” because the bacteria put elemental nitrogen into a form that can be used by living organisms and do not allow it to leave that form and revert to elemental nitrogen. Nitrification: Certain bacteria take the forms into which nitrogen was fixated and further process it (oxidization). Oxidation provides energy for the nitrogen cycle to take place — the bacteria that live in soil cannot harness energy from the sun. The energy they use during their work in the nitrogen cycle comes from this process. Denitrification and ammonification. Plants absorb nitrates or ammonium ions from the soil and turn them into organic compounds. Animals obtain nitrogen by consuming plants or other animals. Therefore, the waste products of animals contain nitrogen. Ammonium ions, ammonia, urea, and uric acid all contain nitrogen. So regardless of what form of excretion an animal has, some nitrogen is released back into the ecosystem through excrement. Dead plants and animals are food for decomposing bacteria.